GALION — What is the Galion American Legion? Galion American Scarbrough Post 243, 118 S. Market St., is comprised of veterans and their family members. It is one of Galion’s longest operating service organizations. The American Legion was formed by Congress in 1919. The local post was started the same year and chartered as “Scarborough Post” in 1931 to honor Galionite Capt. William Scarbrough, who died of wounds in World War I. It has been at the South Market Street site since 1930ss. It is open to the public, except for the small private club area. This area must remain private due to the stipulations of the state liquor license. The entire building has been smoke free for many years. The banquet hall seats 172, has a full kitchen and is available for rent to private parties or public functions. Legionnaires Ken Green and Mike Mateer have recently stepped forward to take the lead in an effort to revitalize the Post to better support the community. Since January, the Post has become a member of the Galion-Crestline Chamber of Commerce, began a relationship with the Galion Community Foundation as a monthly contributor, increased contributions into the Legion Scholarship fund, started on a long list of needed building repairs, improved the fish frys that generally are twice per month, started looking for ways to better support Boy Scout Troop 7304 that the Post hosts, and is constantly looking for more ways to assist the community. “We needed to start somewhere,” Green said. “We began by bringing back bingo in the banquet hall where it was traditionally held. In two months, we have hit stride with some impressive numbers. Every Thursday, we get 120 or so players. More than 15 towns from outside Galion are always represented. We have a validated business model showing a 12-month profile of more than $250,000 of outside monies being brought into Galion just because of this game. And they’re doing more to help get people to come downtown. Green and Mateer both point to a sign on the north wall of the banquet hall. The sign lists more than 30 local businesses and is growing. Mateer points out. For questions or to talk with Ken or Mike about ideas call the Legion at 419-468-1208. 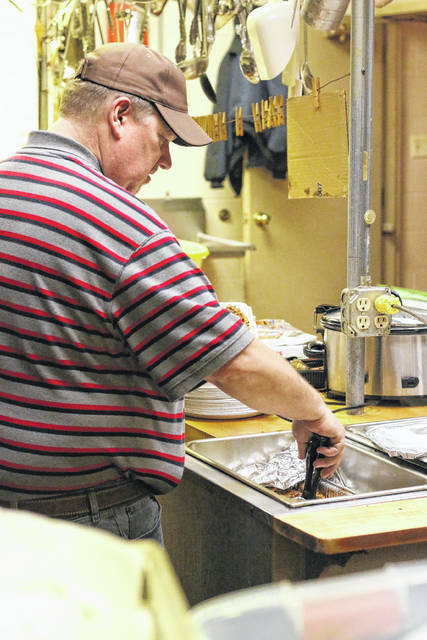 Russ Kent dishes up pulled pork and pulled turkey during a recent hot sandwich night at Galion American Legion Scarbrough Post 243 on South Market Street. Kent’s venture “The Daily Grub” operates out of the Post 243 kitchen on Tuesday nights. There is a different menu each week and he offers eat in, take out, or call ahead and pick up service.